Even compared to Italy? That’s what everyone says when I say Argentina has the best ice cream in the world. Yup. Italian ice is amazing. And it’s served in more extravagant concoctions than ice cream from an Argentine heladeria (ice cream shop). Argentine ice cream is obviously influenced by the Italian variety, but where Italians rarely serve their sweet confections in a cone, opting for artful glass bowls and adding cookies and toppings, most heladerias stuff a waffle cone full and then swirl another flavor on top in a staggeringly tall cone of goodness, and that’s it. Shops offer dozens of flavors, including multiple variations on Argentine favorite dulce de leche. Most are handmade in the shop and, while it’s possible to find Ola and Nestle and other world famous brands of packaged ice cream at convenience stores, it’s not clear why anyone would want to. Ice cream is just as popular in hot and humid Buenos Aires as it is at 11:00 at night in cold and windy Patagonia. There doesn’t seem to be a time or reason necessary for ice cream and we saw kids and adults wandering in shops or sitting down to enjoy a lick any time they could. Once we’d tried it, we could see why. But why? It’s smooth and creamy and never icy. Where U.S ice cream (which is quite good, thank you very much…nobody has more flavors than Americans do!) often separates into a bit of water and melt if you don’t eat fast enough, Argentine helado which was soft enough to easily scrape out of the the buckets was also consistent enough to remain unmelted the whole time. The helado was sweet, of course, but fruit flavors like Patagonia’s famous Calafate berry (legend states that once tasted, you must return to Patagonia) were aromatic and tart, while ubiquitous dulce de leche tasted of warmth and baking. Or maybe it’s the way it’s always stirred and swirled, like American chain Cold Stone. Or maybe it’s all natural and homemade? Or maybe it’s all the terrible industrial chemicals and polymers that they have yet to forbid in latin American? All I know for sure is that this is stuff you just sit there marveling at while eating and wondering if maybe you should order another couple of cones and just skip dinner! I feel sorry for Uruguay. I didn’t see very much of it, and I am quite sure it’s a lovely place with friendly people, untouched beaches, and plenty to do. 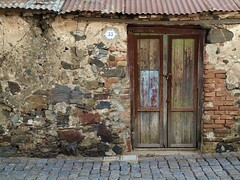 And heck, they clearly have some very effective people doing their public relations, because Colonia del Sacramento sure gets raves. It’s even a UNESCO World Heritage site. Except, I really can’t see why. That’s not to say the tiny town isn’t worth visiting. The barrio histórico (historical neighborhood) is lined with original cobbled streets and 18th century houses. The town is historically interesting as a pirate’s den and black market trading zone and even today celebrates it’s history a free trade zone and an extremely popular destination for ferries from Buenos Aires. The thing is, it costs $128 for two people to take the ferry over and you either have to arrive and leave the same day with only a few hours to visit (this is what you should do) or spend the night so you’ll have enough time to take in the multiple museums in this, like I said, UNESCO World Heritage site (do this only if you have a long trip and time to kill). While we were deciding between those options I was considering all the World Heritage Sites I’ve been to. On this trip, we’d just been to Los Glaciares National Park and walked on a river of ice moving two meters per day. (Tour not withstanding, the Perito Moreno glacier is not to be missed.) World Heritage Sites don’t disappoint. A complete list of sites shows some of world’s unmistakable destinations.Khajaraho, India is on there. Regensburg, Germany is there. Angkor Wat made the list as well. So lofty is the list that the Eiffel Tower doesn’t make it. Neuschwanstein Castle doesn’t rate either. With that in mind, the bus price and a night’s stay make sense, and at the end of the day, I figured it would be cheaper than making it up to another UNESCO site, Iguazu Falls. One site is as good as another, right? Not that the town was “planned.” It was handed back and forth between the Portuguese and Spanish half a dozen times but I suppose that exchange represents a “significant interchange of human values.” Colonia is now doubt important to Uruguay and to its history. No wonder school children were roaming its streets on field trips. That’s fine! And I can’t knock them for promoting the little town, it was, indeed, fairly charming. It’s just that I expected a bit more from a UNESCO registered site and had I known, I might have spent less time, or just forked over the cash for the Iguazu Falls. So go. Have lunch, enjoy. If you’re in the area, and there wasn’t much chance I’d be in Uruguay any time soon, I’d even recommend it. Just know what you’re getting. While you’re there, see if you can tell me who they had to pay to get listed. ‘Cause I’m thinking Louisville, Colorado needs to be included too! When the LaserWriter came out I wound up printing whole binders full of font samples. I took them oddly, naturally, and had an uncanny ability to identify font from samples. With so much proliferation of fonts, ugly and amazing, copies and variations, I no longer can just look at a font and tell its name. That doesn’t mean I don’t care about them. So, have a look, I’m trying out Google Web Fonts. Did they make this page too long to download? Can you see the difference and do you like it? Let me know what you think. Bonus if you can name the fonts…. Food is one of the joys of travel. Savvy travelers make a point to try local delicacies whether they’re proffered by gourmet restaurants or from street vendors carts. I’ve always favored the street vendors above all, because it is this food that most surely represents what local people eat. Upon arrival in Buenos Aires we made our way to the weekly antique market in San Telmo and, hungry from a whole night of flying, made a beeline to the first street vendors we saw. Empanadas we’re served warm from a basket and other young bohemians we’re walking along the market streets offering sandwiches and even cakes. We tried the empanadas and a pan relleno, and, well, um, meh. Turns out, San Telmo’s market really is catering to tourists (so much for my theory on street food). Porteños (Buenos Aires locals) don’t really believe in eating standing up, they take time to sit down and have a meal. 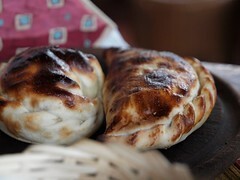 Patagonian empanadas. These were good! Even elsewhere in Argentina, there were almost no street vendors to be seen. Once more, home grown Argentine fast food is almost completely absent as well. I spotted a couple of McDonald’s and perhaps a few other representatives of the global juggernaut of fast-food corporations that homogenize the world over and are the opposite of what many adventurers are looking for. Upon closer inspection, many bakeries and several deli’s offered food to-go and plenty of restaurants have comidas para llevar (take-away meals) but it you have to look for it. Fast-food and take-away food just aren’t a big part of the Argentine culture. This should be music to any foodies ears, except, they’d be making some pretty big assumptions. Is there automatically something wrong with quickly prepared meals? Ask the Thai, who barely need their own kitchen for the staggering abundance of amazing food served from carts. Mmm, pad thai. Mmm, chili mangos. Tell that to Mexicans. Much of the Mexican food served in sit-down restaurants outside of Mexico, from tacos to churros, is more authentically served from carts in-country. Tell that to the Chinese who whip up dozens of dishes from menus pages and pages long all in just minutes, and to the Chinese who frequently spend about as much time eating it as the chefs took to prepare it. Time is hardly an accurate qualifier for food. It certainly is interesting how successfully Argentina has resisted an invasion of world-brands and U.S. American fast-food culture, but I can’t really say it’s made their food any better. Argentine food consists of loads and loads of their famous beef, served in hundreds of parrilla’s (barbecues) around the nation. Here, fine cuts of meat are cooked to death, and asking for your food rare might get you a dry medium. It’s good quality meat, but hard to see what all the rage is about. There are plenty of pleasant pastas, with the same small vocabulary of sauces available at nearly every restaurant (sauces are separate and sometimes included such creative choices as tomato juice). Pizzas are damn good, but, um, that’s mostly it. They’re not big fans of spices, and don’t have much variety in the way of sauces. We had some delicious meals and plenty of boring ones. We ate in nice places, with tourists, moderate places recommended by locals, and dives that we found on our own; food was, well, just fine and not particularly cheap (about the same as in the U.S. or Europe). It is a very pleasant change not to even have to avoid all the fast-food chains or lament how their own food culture is being destroyed by globalization. All the more odd there seemed relatively little food culture to protect. The ice-cream, though? Amazing. Probably the best in the world. Really. But that requires a whole post of its own. It had a pi key! Thirty years ago, Commodore announced the world’s most popular computer, the Commodore64. I had a VIC20 at the time and the Commodore64 was as huge an upgrade as any gadget upgrade today. The screen had twice the resolution, and more colors; you could program your own sounds, and, with unbelievably laborious effort, one byte at a time, create animated sprites which would be the building blocks of your own, homemade video games. Kids had game consoles, like the original Atari, or later, Nintendo, and they were fun. The C64 had plenty of games too, and my thumbs were pretty sore after hours of Loderunner, but I learned to type by repeatedly entering in programs in BASIC. I still type commands like RUN or LIST as fast as if they’re single letters on a keyboard. I wasn’t a particularly good programmer, but there was something amazing about getting the little beige box to do things for you. I programmed it to play little tunes on its built in synthesizer and eventually to play tic-tac-toe. I remember sometimes getting so swallowed up in a programming problem I would be thinking about adding features or how do to something new when I was supposed to be doing homework; and this thing was supposed to help me in school! Still, I was a low-level geek at the time. My own programming masterpiece , a skiing game where a little skier could be moved left and right to avoid trees rushing up toward him from the bottom of the screen, received a little play at school. Other kids were scanning assembly code from cracked commercial games like they were reading the matrix. I think all those kids must be rich now, long retired, traveling the world with their gorgeous wives and donating large sums of money to cure malaria. But now, there will be a new personal computer, the Raspberry PC, which, like the old C64 requires you to attach it to your own television (and worse, you’ll need an extra old mouse and keyboard). The Commodore was cheap, but this new PC will be available for a mere $25. Like the C64, all you’ll see when you turn it on is a lonely little prompt, probably a flashing colon. That lonely prompt is an invitation; a challenge, waiting for you to turn the lump of bits inside into your own masterpiece. I want today’s kids to create their own programs, from scratch. Programs that don’t really do much at all. Programs that say “Hello, world.” or print their names in flowing patterns looped down the screen. Some of kids will take this tiny computer and do amazing things with it, maybe making their own robots, or who new devices. I can’t wait to see it. Except, when I started writing this, I was afraid all we’d never see it. Kids today, and adults too, have so much opportunity to be entertained, they find little time to create. And the remaining creative ones have such a big hurdle to get over. How can they impressed by my little skiing program, after playing Wii sports for a half an hour? How are they going to feel being stared down by that menacing prompt, and the initial, unimpressive results, with an XBOX or PS3 in the other room? Of course, distraction and demotivation will, sadly, be true for many, but I know, from the literally millions of apps at the Apple and Google application stores, from the music sharing sites, deviant art and flickr, that, thankfully, creativity is not dead. Given the tools, some of us will go on to make amazing things. At only $25, many more kids will be able be able make their own digital magic, even if they are only simple text adventures, or maybe their own version of asteroids. Too bad. though, the Raspberry PC won’t have a pi key like the Commodore.